Home » Builder Talk » Casa Distortion: PEDALpUNK! So let me just admit right off the bat – the PEDALpUNK! by Casa Distortion isn’t a pedal in the traditional sense. You’re not going to put in on your board and it doesn’t have a foot switch. So in terms of our daily mission here at Pedal Finder, we are straying a bit from the wheelhouse. 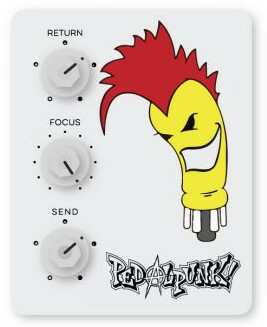 However, the PEDALpUNK is something many musicians could use in their recording world to bring some much needed ‘fresh air’ to their recording. This is because the PEDALpunk allows you to incorporate ANY effects pedal with any type of DAW or recording software. This opens up a whole world of effects outside the rehashed plug-ins swirling around the internet. The PEDALpUNK! comes from the brain of Scott Eric Olivier a multi-instrumentalist and music engineer that has worked on over 200 albums with artists from Michael Jackson (in preparation for Jackson’s comeback tour that was tragically halted), Chris Cornell, Christina Aguilera, the Goo Goo Dolls, Rhianna and more. He’s also a studio musician that can roam from instrument to instrument and one – as you can tell from the musicians he’s worked with – that feels comfortable in a number of genres and styles. The idea for the PEDALpUNK! actually came in the late 90’s. As a sound engineer, Scott began to feel tired about the same old plug-in options for sound design. He knew that physically, there was a plethora of option for effects from a wide range of builders. The trick was finding a way to tap the software into a real effects box in order to bring out the natural textures that are hard to find in software alone. The PEDALpUNK! offers a combi jack input and choice of XLR or TRS jack output, while pedals plug into the return/send effects loop. Return and send level controls can be used to overdrive pedals in the loop or the PEDALpUNK!’s input transformer respectively, while the focus knob allows players to adjust the input impedance of the signal at the send jack, useful for non-buffered, true bypass fuzz and distortion pedals. The PEDALpUNK! is officially available April 24th. As usual let us know if you get to hang out with this pedal. If you do leave a review at Pedal Finder. And don’t forget to check out PEDALpUNK! at their FB page or at their website.